Toyota is reminding the public just how environmentally friendly and helpful the third generation Prius is, with 18-foot flower sculptures in cities across the United States. The Solar Flowers, also known as Harmony Between Man, Nature and Machine, include a place to sit and soak up the sun, and use their solar panels to provide free Wi-Fi access and charging stations. The Prius Solar Flowers will spend a few days at a time in Boston, New York, Chicago, Seattle, San Francisco and Los Angeles. See the campaign online at Facebook. The Solar Flower campaign was developed at Saatchi & Saatchi LA Los Angeles by executive creative director Mike McKay, creative director Andrew Christou, associate creative director/art director Kelly Kliebe, art director Nick Luckett, art producer Kristina Hicks, copywriter Shannon Wilch, director of integrated production/multimedia Tanya LeSieur, integrated design creative director Ryan Jacobs, print producer Gloria Olegario, and producer Britta Couris. The flowers were designed and fabricated by Poetic Kinetics. 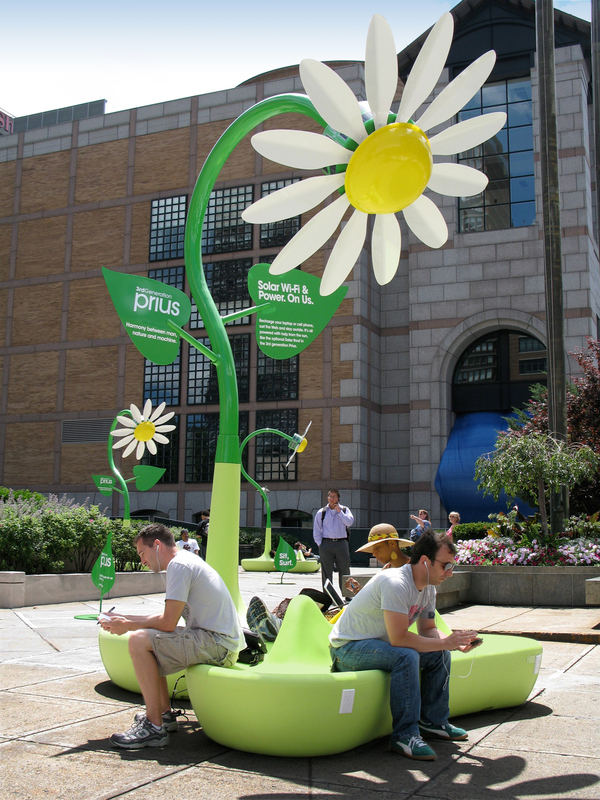 See more photos of the Solar Flowers at Street Attack.